It was used onboard the MIR space station to prevent cosmonauts from possible static discharge while working station on equipment. MIR Space Station Control Sensor Board. This is an actual piece from the MIR's twin sister ship in Russia. MIR Space Station PVK Control Board. This is an actual piece from the MIR's twin sister ship in Russia. MIR Space Station PU BPS Control Board. This is an actual piece from the MIR's twin sister ship in Russia. MIR Space Station Environmental Control Board. This is an actual piece from the MIR's twin sister ship in Russia. MIR Space Station 2SB2-2K Block Main Command Control Panel & Monitor from the core module (base block) of the MIR space station. This is an actual piece from the MIR's twin sister ship which was located in Russia. MIR Space Station Podu Refueling Control Board. This is an actual piece from the MIR's twin sister ship in Russia. This is a real Clock from the control panel of a 1960's era Russian Soyuz Spacecraft. MIR Space Station Window Assembly. This is an actual window from the MIR's twin sister ship in Russia. During the MIR mission, the ship was used for training and technical analysis. from a Flown Soyuz TM capsule. The outer frame heat shield protection layer is burnt in places where it is secured by the metal bolt which goes all the way to the outside of the capsule and exposed to high temperature during re-entry. Buran Space Shuttle Cockpit Window Assembly. This is an actual window from the cockpit of the Russian Spacecraft. The ship is almost identical to NASA's Space Shuttle. This is a FLOWN Ventilator Fan which was used inside a Soyuz capsule. It has a cover, protective net, and electrical motor with wire. It could be adjusted by moving around a pivot joint. It was removed from the a flown TM Soyuz spacecraft. 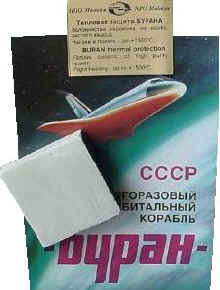 piece of Russian space history. This is a FLOWN Navigational Scope which was used onboard a Soyuz capsule. It allowed the crew to line up the spacecraft for retrofire and return to Earth even if all other spacecraft systems failed. The Scope also allowed cosmonauts to determine the attitude, range, and range rate information for docking with the ISS. This is an actual Zero Gravity Toilet that was used on a Soyuz Spacecraft that flew to the MIR Space Station. This SOKOL Space Glove was made for and used by Pham Tuan. Pham was the first Asian cosmonaut in space on the Soyuz 37 which was launched in July, 1980. This is an authentic SOKOL space suit. It was designed in the early 1970s to protect cosmonauts during launch and landing or unexpected emergencies. and the International Space Station. They are part of a Russian ORLAN EVA space suit. This Water-Cooled Garment is worn underneath the ORLAN EVA space suit. The garment does its cooling by passing chilled water through plastic tubes interwoven throughout the suit. Russian High Altitude Suit is a multi-layered unit consisting of the full pressure suit, gloves, boots and a hermetically sealed helmet. It is designed for long duration, high altitude flights. Flown Cardiovascular Belt used by cosmonauts onboard the MIR & ISS space stations during physical testing and exercise workouts. This Soviet Flag was flown for 95 days on the Soyuz & Salyut Spacecraft and was signed by flight engineer Georgi Grechko & cosmonaut Yuri Romanenko. Russian Federation Flag was flown on STS-105 to the ISS by Russian cosmonaut Vladimir Dezhurov. Russian Air Force Flag carried on board STS-108 Endeavor to the ISS by cosmonaut Yuri Onufrienko. is signed on 2 flags by cosmonaut Alexei Leonov. Russian Space Pennants & Mission Pins that were carried on board Soyuz Spacecraft & the International Space Station. which is very similar to NASA's Space Shuttle. Both the U.S. & Russian tiles are made of a low-density, high-purity silica fiber (derived from common sand) insulation that is made rigid by ceramic bonding. These Cigarettes were made in Russia by Phillip Morris especially for the Apollo-Soyuz mission. This hard pack/box of cigarettes is autographed by the commander of the mission cosmonaut Alexei Leonov. We have numerous hand made models of Russian, American and Other Countries Spacecraft. Soyuz launch key, used by cosmonaut Anatoliy Berezovoy - Vice-Chairman of the USSR Cosmonautics Federation. Medal presented at the Cosmodrome Baikonur in honor of the 25th anniversary of the first space launch (Sputnik-1) 1957-1982 and for the anniversary of Baikonur Launch Rocketry Team. Russian space program pins and badges. Each one has a different design. These were all originally issued during the 60's and 70's. pieces of Russian space history. Original Blueprints for the frame of the Russian Buran Space Shuttle. This 40" X 23" blueprint is signed by the Russian designers, controllers and technicians. It shows many technical specifications & details and was used to build an actual Buran Spacecraft. Original Blueprints for the the Russian MIR Space Station. This 24" X 36" blueprint shows many technical specifications & details used to build the space station. Used for controlling, checking and monitoring atmosphere pressure in the lock chamber during attachment of the space station with other spaceships and for pressure equalization during cosmonaut EVA's. This suit was used by cosmonauts training to fly the Buran Space Shuttle. Museum of Discovery & Science in Fort Lauderdale, Florida. We also have received a personal photo greeting directly from the Commander of the International Space Station. If you would like to use any of the pictures from this web site for educational, newspaper or magazine articles, please contact us. In most cases we can e-mail you the original, high-resolution files for you to use. Of course this ONLY applies to pictures that we have taken or have the original copyright owners permission to use & distribute. nor do do we sell any products or services.